Almost three years ago, my husband and I stopped for lunch at the little Baja restaurant whose sign is pictured above, and I immediately noticed the prolific vine covering the fence out front. Its orange blooms overpowered even the adjacent bougainvillea, and I snapped several pictures. Once we entered, the roadside restaurant was quiet, the inexpensive food turned out to be delicious, and its proprietors were quite friendly, and I asked–in my ungrammatical and faulty Spanish–if I could purchase some of the basil I’d also noticed growing outside. We love to make pesto and basil is not always easy to find in Baja. From her post, I found out its apt name: Mexican flame vine. And I started to think, maybe . 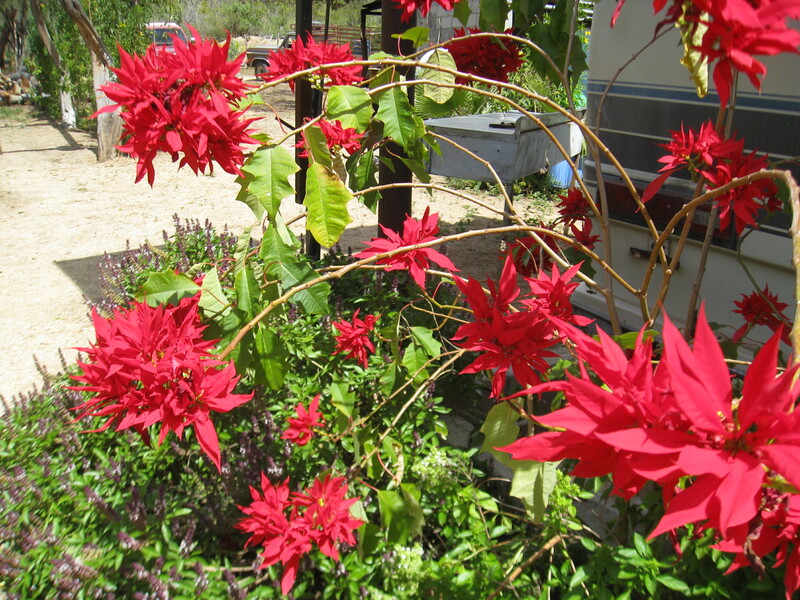 . .
Last spring, while browsing plants for my new backyard landscape, I visited a local nursery and was delighted to see Mexican flame vines for sale, so I brought home two specimens to plant. 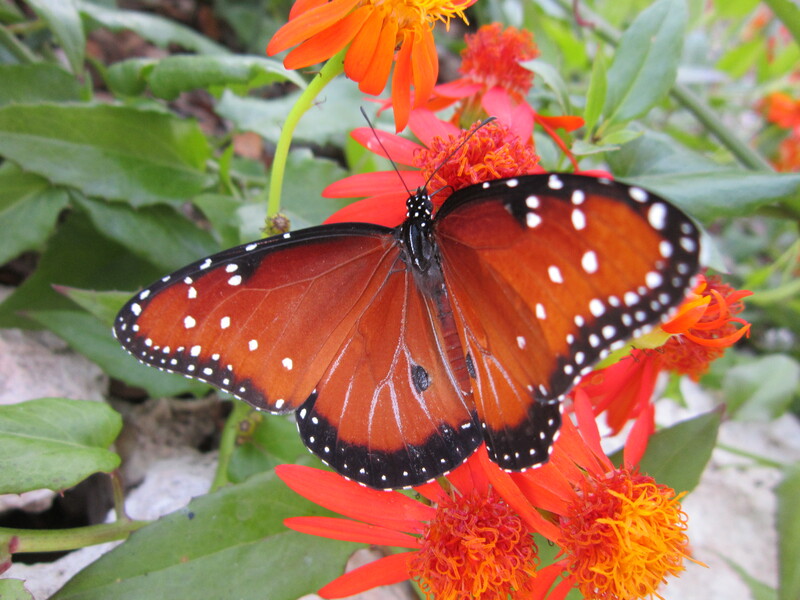 By fall, not only did I have two vines which had thrived in the heat and strong sunlight of summer (I’m hoping they’ll survive this current coldish winter), I also had Queen butterflies visiting their bright blooms as well. All that warm orange reminds me of Baja and the hospitality of its people, speaking to me of the bright flame of their generous spirit. Do you have associations with certain plants? Do certain flowers remind you of particular people, for example? Whose generosity has surprised you in an unexpected place? 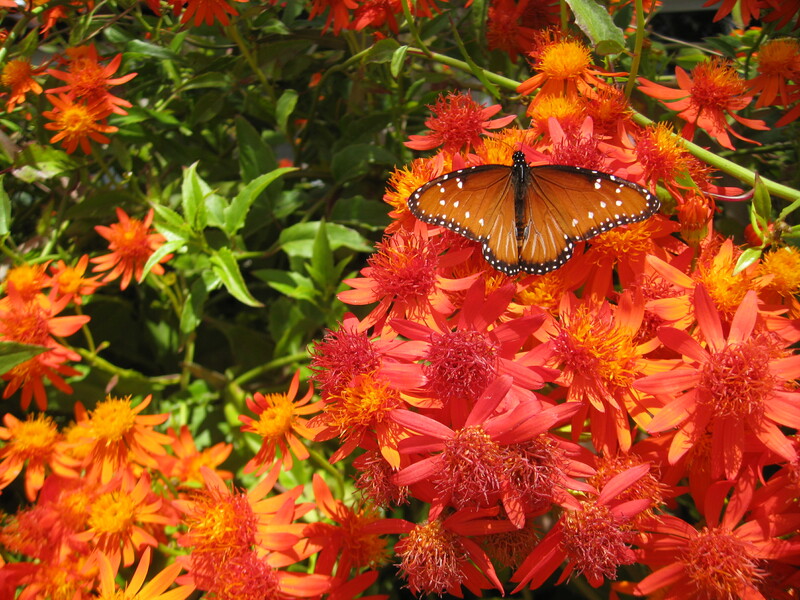 This entry was posted in Baja, butterflies, flowers, human stories, Texas hill country. Bookmark the permalink. I was speechless for a moment, then accepted her shirt as a gift and invited her and her friend back to my house for coffee. It was an amazing exchange that I still cherish – how a “stranger” taught me to receive with grace! How wonderful that we can inspire each other, Chirs…my thanks to you, Sister! Chris, Your gifts as a writer and a person shine especially brightly in this post. (The photos are lovely too!) Thank you for brightening my day–I could hear your voice as I read, which was a special treat. Hugs to you and Ron there in the Baja sun…. Chris ~ Please help me get on your blog. I have tried several times but somehow it’s just not working. Dear Linda forwards them to me. I want to be one of your groupies! Thank you for such a compliment–I am so glad you’re enjoying the blog. I just put your e-mail address in–have you received a confirmation e-mail? If you don’t receive one soon, please let me know and I’ll try to figure it out. My guess is that your computer has some settings which are blocking your attempts at signing up. I’m in! An official member of the Chris Bradley and her marvelous writing club! Thanks so much.